Plot: Without giving anything away, the film is about a war in Heaven. The armies of Heaven and Hell are battling for God's favor. The angels of Hell want to be back in God's graces, while the angels of Heaven want to defend the human race because God favors them above all else. While the film doesn't take place in any celestial or eternally damned landscape, the events instead unfold on a Native American reservation in Arizona. Why you should watch it: In a word - Walken. 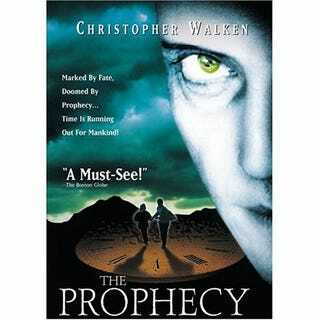 Christopher Walken is the Archangel Gabriel, a highly ranked angel who wants revolution in Heaven. He is anarchic, attempting to bring chaos. Elias Koteas plays Detective Tom Dagget, who once considered priesthood, but lost his faith. Dagget finds Simon, played with a quiet strength by Eric Stoltz, and begins his investigation of a dead angel who is armed with a bible with a 23rd chapter of the Book of Revelations, which foretells of a war in Heaven. In all honestly, the story is the main reason I chose this film. Is the acting great? No, not really. Are the special effects mind-blowing? Nope. However, sometimes a story makes a film. This is one of those times. I found the idea to be a very high-concept one. What if there were angels who were jealous of humans? What if, unbeknownst to us, they were waging a constant bloody war for control of us, for good or for bad? Unfortunately, there were sequels made for this movie, and they sucked. Badly. Avoid them at all costs. However, if you've nothing to do this chilly end of November, you should definitely check this out. By the way, if you want to see a fantastic and truly chilling representation of Lucifer, watch for Viggo Mortenson at the end of the movie. His Lucifer is truly what Lucifer should be - unpredictable, menacing, horrifying, and deadly. He's only in the film in the last 15 minutes or so, but he makes the most of his role and it is memorable.